Great Smoky Mountains National Park is the most visited national park in the country, offering easy access from many cities around the Southeast. While you hear all about the epic hiking and backpacking in these ancient hills, the sheer diversity and quality of the wild trout in its waters make the park a world-class destination for fly anglers, too. 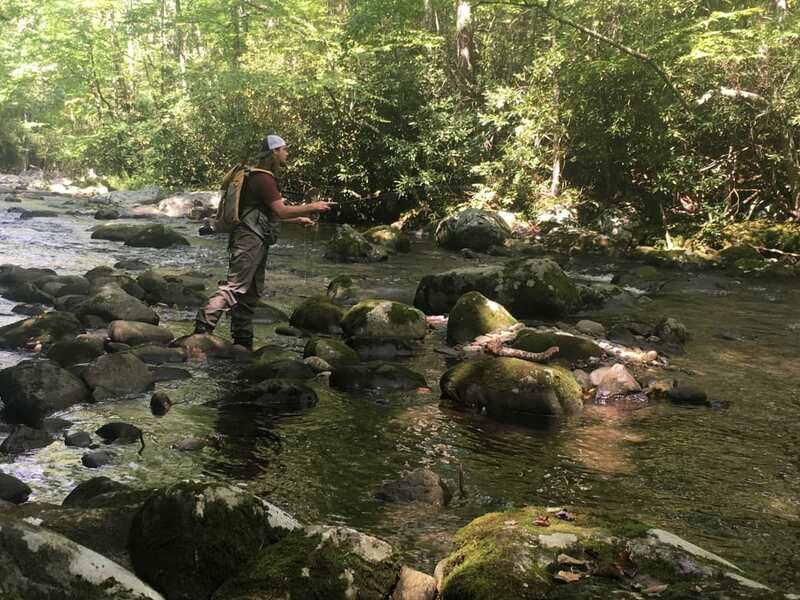 We put together a list of seven of the best year round spots that will have you planning your next fishing trip to the Smokies in no time. Flowing from the crashing waters of the Sinks area to the little town of Townsend, the main section of the Little River is hands down the most popular fishing destination in the Smokies. From steep pools lined with rocks to wide riffles along stands of evergreen trees, this section of the river offers plenty of opportunities to fish for brown, rainbow, and brook trout. The entire section of the river is accessible by road, which allows you to cover a lot of water, but also means that it can get crowded. This stretch is best fished during the middle of the week or in the spring or winter when the water is too cold for tubers. To get away from the crowds, head to the Middle Prong of the Little River above the Tremont Institute. The trout here are smaller, but more aggressive, and will take flies year round. This branch is the perfect mix between a small creek and a big river, with plenty of casting space and opportunities to present your flies. From the paved section of Tremont Road, anglers have a chance to catch smallmouth bass, redeye bass, and even larger brown trout. As the paved road turns into dirt and eventually leads to the Middle Prong trailhead, you’ll find less crowds and more opportunities to catch native brook trout and rainbows in the smaller tributary springs. 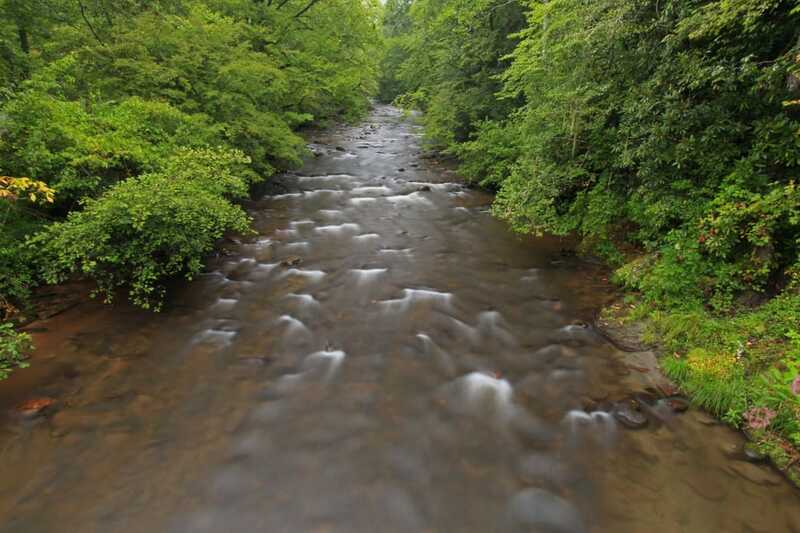 Converging with Jake’s Creek, this section of the Little River begins at the historic Elkmont community and campground, where Knoxville’s elite used to vacation during hot summers in the early 20th century. As you hunt wild trout, walk among the old craftsman-type houses and keep an eye out for a young black bear roaming around the area around sunrise or sunset. The river is easily accessible by a wide trail, but it can get quite busy during the late spring, late summer, and fall. If you want to really explore fishing in the Smokies, Elkmont campground is a great place to set up basecamp for a weekend. Located above the Twentymile Ranger Station and accessed from the legendary Deals Gap Road section of U.S. 129, Twentymile Creek is your chance to catch big, healthy rainbows with low crowds. Since the creek is fairly isolated and flows into Fontana Lake, a mix of low pressure and ample aquatic nutrients allow these fish to grow larger (on average) than other places in the park. Access to Twentymile is all by trail, but you will have to look for opportunities to break off the path and descend steep hills to find the idyllic pools where the leviathans lay. If fly fishing is just one part of your active and adventurous lifestyle, Twentymile is an excellent place to access the Appalachian Trail and see the wild azaleas on Gregory Bald or launch a kayak into Fontana lake from the ramp across the road. What makes this the ultimate fishing shirt? If you’re approaching from the North Carolina side of the Smokies, Deep Creek is a top destination for Southern Appalachian fly fishing. 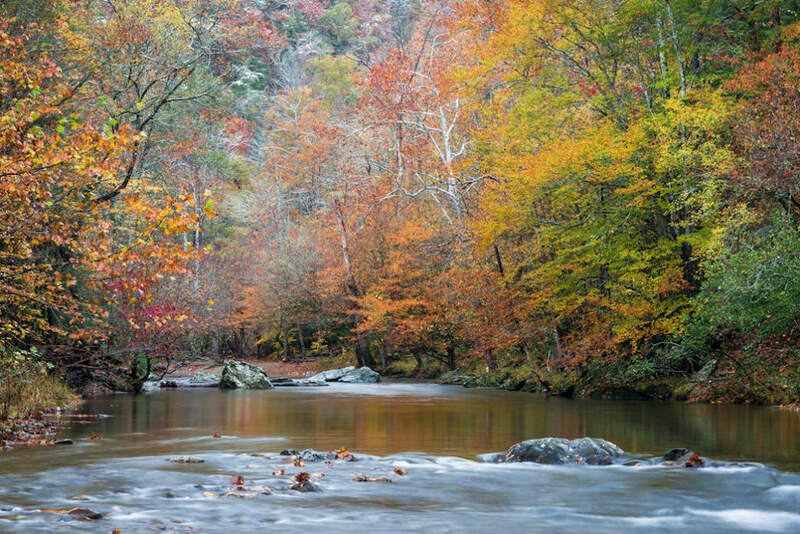 Located minutes from Bryson City, North Carolina, Deep Creek offers some of the best small stream fishing in the Southeast. Here, native brook trout get pretty big and aggressively take dry flies and streamers. Bryson City is a great destination in itself, and has established itself as a fly fishing mecca. Within the last year, Bryson City opened the Southern Appalachian Museum of Fly Fishing and held the first annual Smoky Mountain Fly Fishing Festival. After a day of creekin’, anglers can tour the museum and grab a local brew and pizza within a 15 minute drive of the Deep Creek campground and parking lot. Though we all love fly fishing for trout, there are many species that can be pursued with a fly rod. 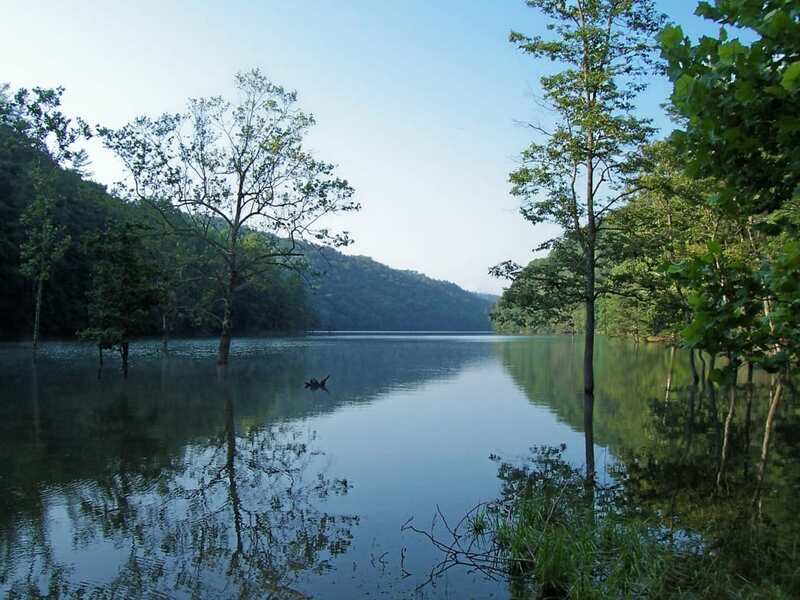 Surrounded by steep wooded hills, Fontana Lake is a smallmouth and panfish destination for any angler. Whether your preferred water vessel is a jon boat, canoe, or paddleboard, Fontana is an otherworldly body of water worth exploring. If you’re fond of staying out on the water, Fontana has several boat-in campgrounds along the shore. With a dry bag and a fly box, it’s easy to get away from the summer heat and stay out of sight for the weekend. Bring plenty of "popper" flies and target the mouths of creeks and streams where smallmouth and panfish will aggressively strike forage on the surface. The Smokies are blessed with, quite literally, thousands of miles of streams that linger through the hollers and valleys of the mountains. If a stream holds water year round and consistently connects to another stream or river, there are most likely brook trout—the only native species of trout to the Smokie, having lived in those streams since the last ice age. So, if you’re up for a little adventure and a lot of uncertainty, find a blue line on the park map, find the lowest point of access downstream, and follow it up until you run out of water. You’ll be amazed at the number of aggressive and gorgeous brookies that will attack a bushy size 12 dry fly. These fish average seven inches long. While 12 inchers are considered monsters, they’re a treasure to behold when you bring them to the net. But then again, isn’t any fish in a pristine mountain stream?